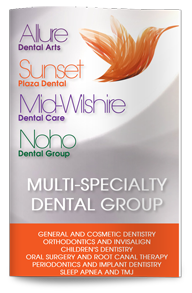 I always feel welcome and the staff is professional and friendly I love having a confident smile and always recommend Sunset Plaza Dental. They feel like family to me! For many people, bad breath is nothing more than a temporary annoyance. For others, bad breath can be a chronic problem. Bad breath can be caused by bacteria in your mouth breaking down the proteins in food. Bad breath can also be the result of dry mouth, which can actually lead to tooth decay. Luckily, there are a few quick fixes you can use to treat your bad breath. Drinking water is always helpful when it comes to bad breath, as it results in the creation of more saliva. Our saliva contains oxygen in it that neutralizes the foul-smelling sulfur compounds that are released when bacteria break down food particles. Saliva has also been shown to contain compounds that help protect the teeth from decay. In addition to drinking water, chewing sugar-free gum can also help promote saliva creation. This is especially true of sugar-free gums that contain xylitol or sorbitol. Also, it is important to be aware that some medications can limit saliva production and lead to dry mouth. These medications include decongestants, anti-depressants, and blood pressure drugs. If you take any of these medicines, be conscious of the fact that you may need to drink more water. Vegetables are also particularly helpful with bad breath. Crunchy vegetables have a tendency to remove plaque that has accumulated on the teeth and gums, which is good because it lowers the amount of bacteria present in the mouth. Fibrous vegetables have been known to increase saliva production. It has been show that green tea and mint tea have odor-neutralizing traits, as they naturally help decrease the sulfur compounds in the mouth. And of course, mouthwash is always useful for controlling bad breath. Another good way to prevent bad breath is to maintain proper oral hygiene. Part of your regimen should include a visit to the dentist every six months for an exam and dental cleaning.